Things went as expected at the Copper Box Arena in Hackney Wick, London, as the favourites justified their tags. 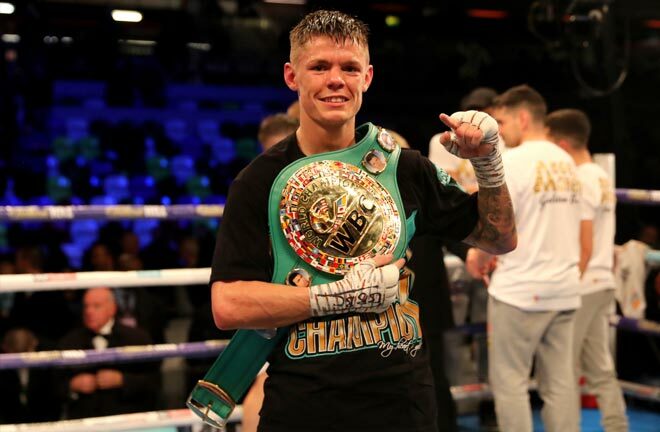 Top of the bill saw Charlie Edwards do as expected and safely negotiate a first defence of his WBC Flyweight Title against the limited and light punching Spaniard, Angel Moreno. Moreno struggled to get close to Edwards due to the Croydon man’s supreme jab, and he picked Angel off at every available opportunity. He mixed great boxing skills with a fair degree of showboating against his frustrated opponent, much to the admonishment of Edward’s corner at the end of the fourth, in an effort to keep him focused. The rounds went by in the same manner and pattern, although a straight right forced the visitor to touch the canvas, and a knockdown was counted despite Moreno’s protestations. 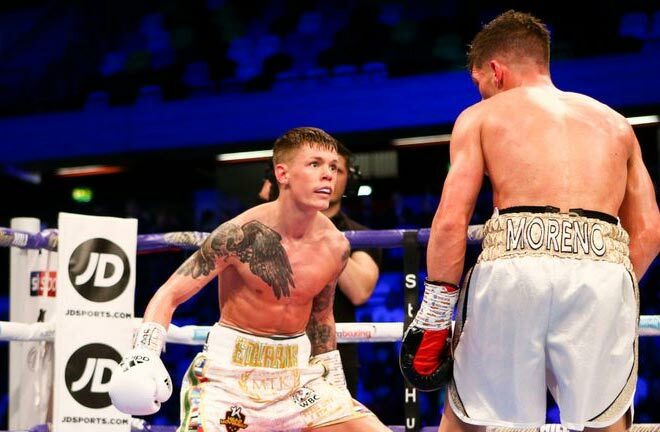 Edwards continued to outsmart and outpunch Moreno, and took a deserved 120-107 verdict on all three scorecards to retain the famous green and gold belt. Edwards was content with a punch perfect performance, and talked of unification, in particular the IBF Champion, Moruti Mthalane alongside his promoter, Eddie Hearn, as well as a step up to Super Flyweight to potentially meet WBA Champion, and fellow Brit, Kal Yafai. The sky is the limit for the likeable Edwards. Joshua Buatsi added the vacant British Light heavyweight Title to his ever growing collection with a devastating third round knockout win over Liam Conroy. Buatsi was loading up from the off, landing with powerful combinations. His blurring hands and variety of punches were causing Conroy no end of problems, but he was at least afforded some small successes in the third, before a right hand to the side of the head buckled his legs and then dropped him. He never recovered, and a jolting right hand landed the Barrow in Furness man on the front of his face. He bravely rose, but referee, Phil Edwards, wisely waved the fight off. The plan going forward is to try to get Buatsi a spot on the big Anthony Joshua v Jarrell Miller bill in New York in June, with Buatsi surely a boxer the US fight fans will love. Shannon Courtenay made her eagerly awaited pro debut at Bantamweight with a dominant win over Cristina Busuioc, who had to hastily be fitted with a body protector during her introduction. 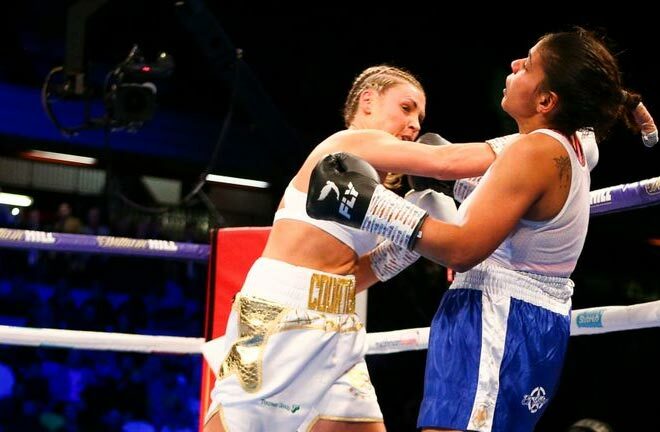 A left hook shook the Romanian to her boots in the opener, but she managed to see out the round. Courtenay was all over her opponent, and was impressively picking her punches, mixing up her attacks to head and body. It was non stop action, and one way traffic, but ultimately Shannon had to settle for a entertaining 40-36 points win on the referees card. Laurence Okolie regained the Commonwealth Cruiserweight Title, and retained his British belt, with a fourth round stoppage win over the outgunned Wadi Camacho. Okolie started brightly, with straight right hands causing Camacho problems, and a short left hook finding a home in the opening session. Wadi was giving Okolie too much room to use his considerable reach, and “The Sauce” continued his good work in round two, with his right hand down the pipe hitting he target like a radar. Two more of that very same shot wobbled Camacho, and had him hurt, but he managed to negotiate the round. The third at least saw improvement from Camacho, with a left hook bouncing Okolie’s chin, momentarily forcing him to hold. Normal service was resumed though, as a short right from Okolie on the inside shook the Spanish born Londoner. A blatant shot at the back of the head drew a warning for Okolie from referee Mark Lyson near the end of the round. Okolie was relaxed, and was bullying Camacho around the ring, and the pressure told, when a right hand followed by a barrage of punches saw Camacho sag to the canvas. He beat the count on unsteady legs, but after another straight right pierced the defence, driving Camacho towards the ropes, the referee had seen enough, and stopped Wadi on his feet, to little complaint from the fighter or his corner. Eddie Hearn suggested that a fight with former Cruiserweight World Champion, Denis Lebedev is available to Okolie, but this depends on weather Laurence’s team are willing to take such a step up so early in his career. In the televised show opener, Lewis Ritson returned following his shock defeat to Francesco Patera, with a move to Super Lightweight. He negotiated a trickier than expected test against German Benitez of Argentina to win the WBA Intercontinental Title. Two scores of 98-92, and a third verdict of 99-91 were not a true reflection of the action, as Benitez more than matched Ritson for work rate and desire, and had his fair share of success during the contest. Ritson struggled to pin his opponent down, and was moving mainly in straight lines, allowing Benitez to tag him on several occasions. Ritson banked the rounds, and used his jab to good effect, gaining the nod of the three judges, albeit by too wide a margin. Post fight, Eddie Hearn suggested the next move for Ritson could well be against the winner of the British and European Title clash in Liverpool next weekend between Robbie Davies and Joe Hughes.